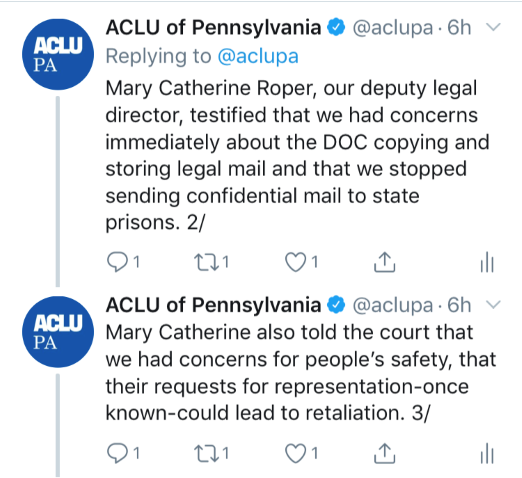 At the first day of testimony in federal court in Harrisburg on Tuesday, four lawyers and one person who is currently incarcerated testified that the Pennsylvania Department of Corrections’ new policy of copying and storing mail between lawyers and their clients in the state prisons significantly hampered their ability to communicate with each other. Federal district court Judge John E. Jones III is presiding over the hearing in PILP et al. v. Wetzel and Hayes v. Wetzel, two cases that challenge the prison system’s policy as a violation of the First Amendment right to attorney-client confidentiality. Until last fall, legal mail was opened in front of the intended recipient, checked for contraband, and given to the prisoner. But in October, the department changed that practice. Now, legal mail is still opened in front of the prisoner, but, after checking for contraband, prison staff then copies the document. The copy is given to the prisoner, and the prison staff stores the original. 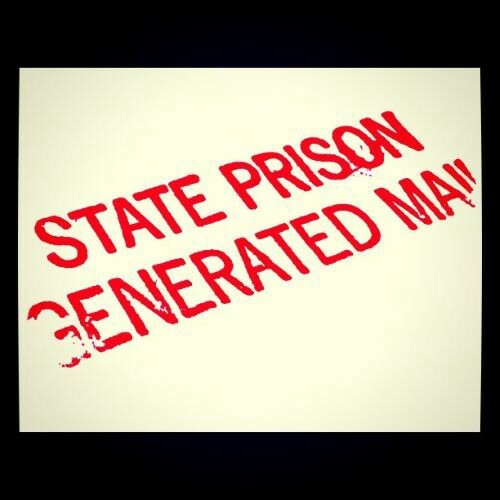 In testimony today via videoconferencing, Davon Hayes, a prisoner at SCI-Smithfield in Huntingdon who is challenging the practice, said that he has never actually seen the originals placed into the locked bin where they are to be stored and that he is unable to see the copier that is used for producing the copy. Furthering the point, in his own testimony, Hayes talked about the experience of a guard looking at his legal mail during a cell search in 2011, long before the policy of copying and storing mail started. According to Hayes, the guard read the complaints that Hayes had filed, including a complaint to the local district attorney. When Hayes asked him to stop, the guard called him “a rat” and kicked his mail and his religious materials. Also on Tuesday, the court heard from two attorneys from the Federal Public Defender — Leane Renée, chief of the Capital Habeas Unit in central PA, and Lisa Freeland, chief of the FPD in western Pennsylvania. Renée and Freeland both discussed the impracticality of visiting their clients, with long drives across the state and hurdles created by prisons’ rules, which are often different from one prison to the next. Renée testified that, under the previous policy, lawyers in her unit would typically send letters with their opinions and thoughts about a client’s case and draft briefs. Her attorneys stopped doing that when the new process went into effect in October. Because the DOC also requires that legal mail provided by attorneys to their clients during visits be copied and stored, the lawyers in her office have no confidential way to provide physical copies of documents to their clients. Freeland, who represents Hayes, said that her decision to cease sending confidential information put a strain on their relationship. Hayes had advanced his case through the appeals courts while representing himself. The Federal Public Defender started representing him last year, so when his new attorneys stopped communicating by mail, Hayes became frustrated and threatened to dismiss them, after years of having total control as his own lawyer. On Wednesday, the ACLU-PA and our fellow plaintiffs will continue our case with testimony from several officials from the Department of Corrections, a former warden of San Quentin Prison in California, and another prisoner. Along with ACLU-PA and PILP, the other plaintiffs and co-counsel include the Abolitionist Law Center and the Amistad Law Project, with volunteer attorneys from the law firm Schnader Harrison Segal & Lewis. More information is available at aclupa.org/PILP. Update: Wednesday’s proceeding has been cancelled due to weather.